Seriously? Cheese and sausage? How can this not be the best soup you’ve ever had. But I don’t care because I make my own chicken stock, and that means I can make awesome soups. This recipe is something that I threw together and was an amazing success. It will be part of my cold weather repertoire from now on. Simple, and delicious. This version probably serves 6-8 people. We fed our family of 4 and had enough for leftovers. 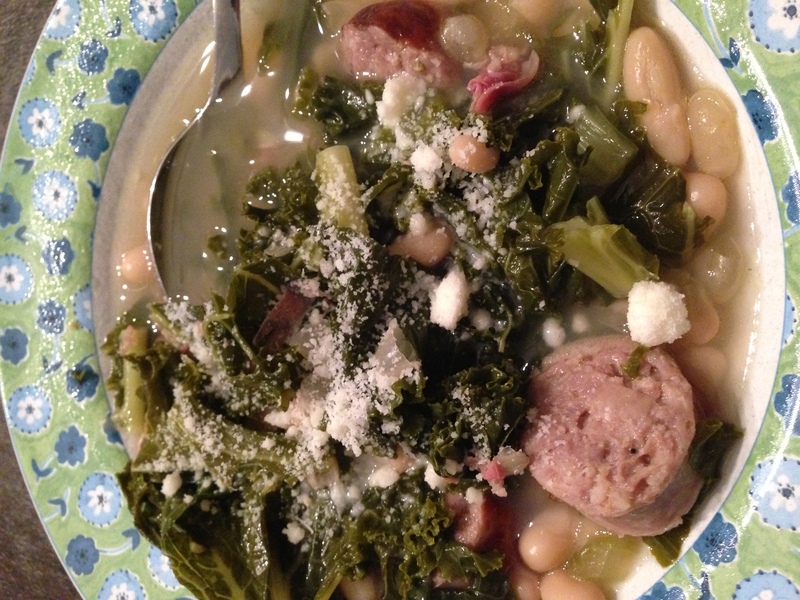 The fennel from the sausage really comes through in the soup. Top it with some parmesan cheese and some crusty bread and it’s a meal. In a large skillet, brown the sausages with 2 TBSP of olive oil. Don’t worry about cooking them through, just get the outside nice and brown. Add a bit of the chicken stock to deglaze the skillet, making sure to scrape all of the tasty brown bits from the bottom of the pan. Transfer the mixture to a soup pot and add the rest of the stock, as well as the bay leaf, carrots, kale and the sausage pieces. Let the soup simmer for 30 minutes on low, until the insides of the sausage are done. Take one can of cannelini beans and , without draining them, puree. Add to the soup to thicken it. Take the other can of beans, drain and add. Go to bed with a warm, full, fat belly. Cranberry Orange Relish – The easiest recipe ever. Munchie Melee 2012- THE ULTIMATE COMPETITION!